September 10, 2014 Nefer Khepri, Ph. 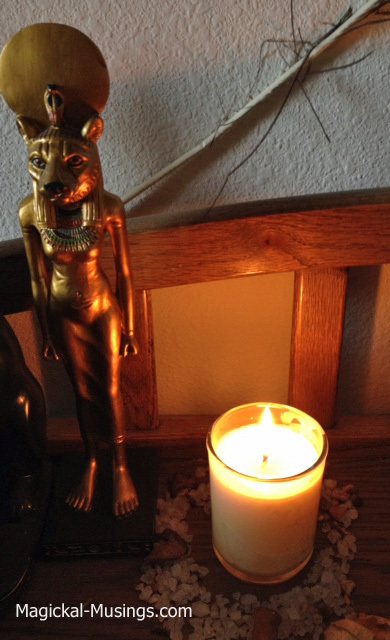 D.
A Metatron candle burning next to my 9 1/2″ statue of Sekhmet. In appreciation to all of my blog followers, Facebook friends & followers on Twitter I am offering you all a limited-time BIG discount on my Single Votive Enchantment (aka Spell) service I offer through my website. My votives are all homemade by yours truly and instead of the typical 2 ounce size you find in the stores & at Yankee Candle, my votives are 3 ounces of 100% pure soy wax. They measure 2 1/2″ tall by 1 3/4″ in diameter. I make them in single large batches for general intentions that can later be custom-related to your specific magical intentions with the addition of particular herbs and sometimes additional essential oils. Intentions run the range from things we wish for to things we really wish we could get out of our lives and everywhere in between. You name it and I can perform an Enchantment for that specific purpose. My main batch of each type of candle contains a particular blend of essential oils. In order to then fine-tune that candle to your specific needs I then add herbs to the top of the candle as I perform your Enchantment for you. The herbs are what make all of my Enchantments custom-designed with your specific needs and desires in mind. Every Enchantment is accompanied by a brief report detailing how your candle behaved as it burned and concludes with my own psychic interpretation of your candle remains. That is like receiving a reading on how your candle’s energy worked for you and gives you a very good idea of what you can expect in terms of results. Regular price is $45.00 USD, but I am extending this offer today to you all as a special thank you for ONLY $33.00. That’s a savings of $12 off the regular retail price. Discounted Enchantments will also include the same type of Enchantment Report that I put together for clients who pay full price and specific herbs added to your candle to better suit your magical intentions. I am not skimping on this at all just because it’s a special offer. In order to take advantage of this offer, please use the link HERE. Do not use the payment links at my website. I am not advertising this offer at my site so all those links are for the regular price. Payment is handled via PayPal and even if you do not have a PayPal account you can use your credit card there with payment being secure. Orders will be filled on a first-come, first-served basis and are scheduled according to lunar phases and days of the week in order to provide you with the optimal type of lunar and solar energy required for your specific magical intentions. Enchantment Reports are delivered 1 to 2 days after your candle has gone out. 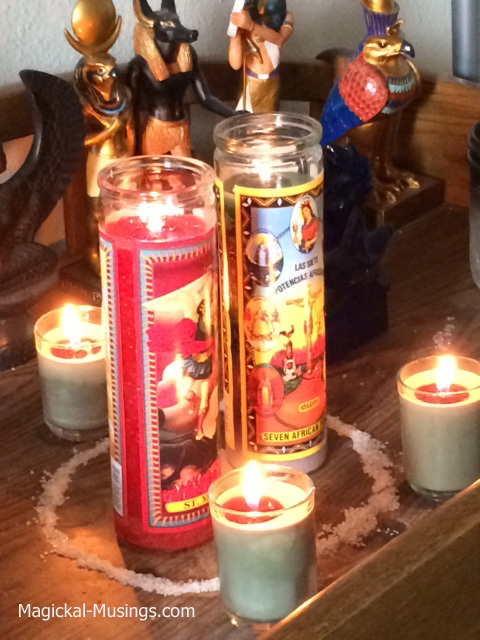 3 of my votives with 10″ high saints candles. (that’s double the time of a store-bought paraffin wax 2 ounce candle), so let’s say I perform your enchantment on a Monday at 10:30 AM. Your candle will still be burning 24 hours later, so usually it is a 2-day wait for Enchantment Reports unless your candle burns down faster than average. If I perform your Enchantment on a Friday, please keep in mind I have the weekends off to spend with family and focus on my art, so you can expect Enchantment Reports for Friday Enchantments (this includes all Love enchantments) to go out the following Monday. Here’s the payment link. This offer EXPIRES on: FRIDAY, SEPTEMBER 19th. Any orders that come in after that day will be promptly refunded in full. No exceptions. Thank you for following me online here, over on Twitter, and on Facebook. I have “met” many lovely people online and I appreciate you all. Without all of you Magickal-Musings.com would not exist and I’d be miserable in a 9-to-5 job. I give thanks every single day for the tremendous blessing of being able to work at home since 1997. This has also allowed me to be a stay-at-home mom for our daughter who has never known a day of daycare. My husband and I are all too aware of how blessed we are and that blessing is due to my clients all around the world and to all the encouragement and support my online friends provide for me on a daily basis. Next How To Help a Spirit Crossover.